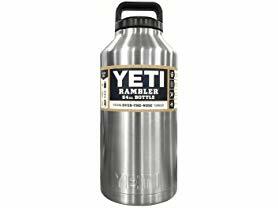 *HOT* Hurry over to Woot.com because right now this YETI YRAMB64 Rambler 64oz Stainless Steel Bottle is just $33.32 (Reg. $69.99)! Unlike narrow-mouthed water bottles that are a hassle to fill or rinse, our Rambler™ 64oz Bottle has a wide opening – our Over-the-Nose™ Technology – for easy loading, drinking, and cleaning. And with the insulated TripleHaul™ Cap in place, you won't lose a drop. Amazon Prime Members can save an extra 10% Off and score FREE 2-Day Shipping!